The game challenges players to help Arlo and Spot avoid obstacles, with gameplay similar to that of Crossy Road. Disney has announced the release of The Good Dinosaur: Dino Crossing, an action game inspired by the Disney Pixar film The Good Dinosaur, which hits theaters on November 25. The game challenges players to help Arlo, a young Apatosaurus, and a young human boy named Spot survive by tapping on the screen to move through environments in a style similar to Frogger (and more recently, Crossy Road). 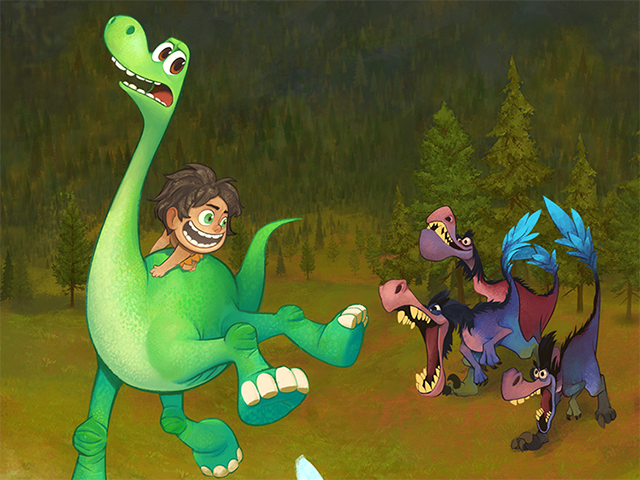 In each game of The Good Dinosaur: Dino Crossing, players tap on the screen to make Arlo or Spot move forward one line in the world, and can swipe to move their character left, right or backward to avoid obstacles or collect berries, the game’s currency. When playing as the combination of Arlo and Spot, players can take one hit, which removes Arlo from the game, and leaves Spot to continue on. The game features multiple gameplay modes. Players have access to the Journey Mode to start, which features 10 stages of challenges. Gamers earn up to three dinosaur prints (think stars) on each stage, depending on their completion speed. These levels have progress checkpoints, so players can start over at a passed checkpoint if they fail to complete the stage. As players finish (or fail) stages, the game takes a screenshot of their progress, which users can share to Facebook. When players fail to complete a level (by allowing an enemy or obstacle to hit them, for instance), they have the option to watch a video to continue playing. Gamers can unlock an Endless Mode by finishing the first four levels in Journey Mode. As the name suggests, this mode challenges players to survive as long as possible. Finally, a Berry Bonanza mode is available within this Endless Mode every few hours, and gives players the chance to earn extra berries. Berries are spent to unlock new characters for use in Endless Mode. In both Journey and Endless mode, players can find power-ups as they run, which may protect them from a hit of damage, or slow down obstacles and floating logs (in water areas) for a limited time, as examples. The Good Dinosaur: Dino Crossing is available to download for free on the iTunes App Store, Google Play and the Amazon Appstore.